It is the 1960s, and the Cold War is well under way. Russia and America are locked in a race to conquer the stars, and the end game is touching down on the lunar surface of Earth’s moon. That competition was not isolated to nations, but was open to the respective men of NASA’s astronaut program. However, the history books would only record one man as the first to walk on the moon’s surface. First Man is a compelling period drama that looks at mankind’s harrowing journey to the moon through the eyes of one of the world’s greatest American icons, Neil Armstrong (Gosling). Strangely enough, Stanley Kubrick is nowhere in sight throughout the film’s 141-minute runtime (that’s meant to be a joke, by the way). Through the lens of filmmaker Damien Chazelle, First Man is a fascinating character study for Neil Armstrong, and examines both his personal and professional life. The film begins with Armstrong’s test flight of the North American X-15 jet and reaching outside of Earth’s atmosphere, attaining heights that only a handful of people in this world will ever realize. After a scary moment where Armstrong almost loses control of the jet, the brass opts to ground him from flying. At home, Neil and his wife Janet (Foy) are dealing with their small daughter Karen, who suffers from a devastating brain tumor. After the tragic loss of his daughter, Neil decides to apply for NASA’s Project Gemini, and he’s recruited into the second groupof astronauts. Under Astronaut Chief Deke Slayton (Chandler), Armstrong and his peers partake in the missions to pursue the first manned space flight to the moon. First Man is a well-constructed drama that looks at the journey to the moon, focused mainly through the perspective of Armstrong, and secondarily through his wife Janet. Chazelle exceptionally reinforces the true and imminent danger NASA’s best and brightest constantly faced when they climbed into contraptions that were basically exploding out from under them. In some ways, it seems foolish for many of these men, almost all of whom have families, wives and small children, to risk everything for a task that might seem trivial on paper. But in First Man’s quiet moments, the significance of accomplishing such tasks and their power are massive. In one of the film’s more effective exchanges, the doomed astronaut Ed White (the incredibly underrated Clarke) voices quiet pride over his son learning more about his father’s position, expanding his horizons and how it grants him faith. It’s a very simple exchange, but it’s probably one of the more introspective looks into why these men signed up to go into space. These pioneers of the stars wanted to explore and go beyond the Earth. It’s an idea that’s simultaneously simple and complex. Chazelle frames Armstrong as a brilliant pilot and engineer, as well as a quiet and unassuming man who is still grieving the loss of his daughter. It appears that Neil Armstrong, through his travels in space, is looking for some greater perspective or introspection into life. His late daughter’s specter constantly looms over him. Some of Chazelle’s directing style is a mixed bag. For the Gemini and Apollo space travel scenes, he does an excellent job of immersing the audience right into the cockpit with the Astronauts. The production team did an exemplary job in recreating the NASA crafts and equipment. Chazelle creates a high level of verisimilitude in these sequences. There’s a certain weight to everything, and it never looks too clean or static, which is a growing problem for a lot of major-budget films these days, where the CG effects look too clean and unconvincing. The drawbacks come more from the Cinéma Vérité scenes that are used on the ground. The camera constantly shaking like mad makes sense when the Gemini 8 module is in a bank and tumbling toward oblivion, but not when a character is simply walking to a car. At times, Chazelle’s documentary, handheld style is quite jarring. There’s an interesting overall look to the film. It’s presented in a very grainy, aged look. It appears as though the film was put in a time capsule and was only recently discovered. After a while, this quality for the cinematography did add to the immersion in transporting the audience back to the 1960s Space Race. The space travel scenes are excellent and tense. Justin Hurwitz’s score becomes operatic and deeply moving in these sequences. The lunar surface scenes are incredibly immersive and visceral, especially magnified in the IMAX format. Chazelle depicts the lunar and space sequences in a way that has never really been presented before onscreen. Most of the performances are incredibly solid; but sadly, few of the other astronauts really stand out all that much other than Gosling’s Armstrong and Clarke’s Ed White to a lesser extent. Corey Stoll seems somewhat miscast as a heelish and prickly Buzz Aldrin. Based on Aldrin’s depiction here, it’s an absolute mystery why Armstrong and Mike Collins (Haas) would want to fly with him to the moon and be willing to allow him to be a part of the crew of the Lunar Module. Some examples of Aldrin’s competency as an astronaut and pilot, along with Armstrong having some faith in his skills and abilities before they are launched into orbit, would have been preferable. At times, Gosling’s performance is incredibly aloof, and he almost runs the risk of becoming unlikable. He manages to pull through with the performance late in the second and third acts. It almost seems as if Armstrong is framed into the generic, workaholic husband who shuts himself off from friends and family to artificially increase the drama. There is a sense that Armstrong was galvanizing himself. Armstrong is constantly and singularly focused on the mission and shutting out the background noise. It seems that any diversion from his focus causes him lose all control, and then disaster strikes. 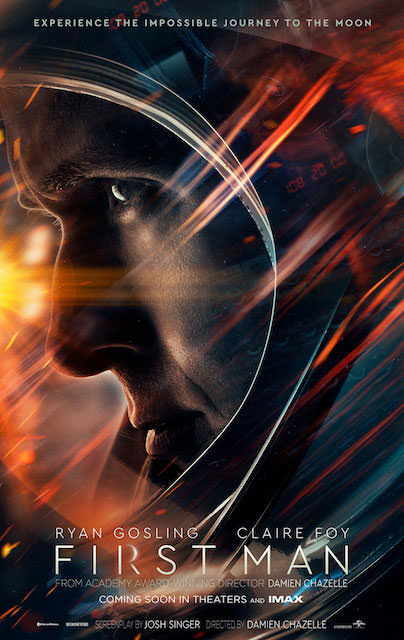 First Man is mostly successful in offering a peak into the real life of the man who, in his own life, became a living legend and accomplished a task thought to be mere science fiction. The portrait of Armstrong’s life does come off as very honest and realistic. First Man offers a compelling look into the life and times of Neil Armstrong while also underscoring the enormity of what he and his peers at NASA accomplished. Armstrong’s successful journey to the moon and back is truly one of the greatest stories and feats ever witnessed. First Man is a compelling look at Neil Armstrong's life, in his journey to become the first man on the moon. Damien Chazelle creates a "mostly honest" look at Armstrong's life throughout the 1960s, along with the toils and risks of the astronauts of NASA, who put everything on the line to expand mankind’s exploration into space. The film is not without its flaws, but the climax definitely makes this worth seeing at least once in the legit IMAX format.